Welcome to this week’s episode of Social Chatter where we cover the latest social media news from this past week. 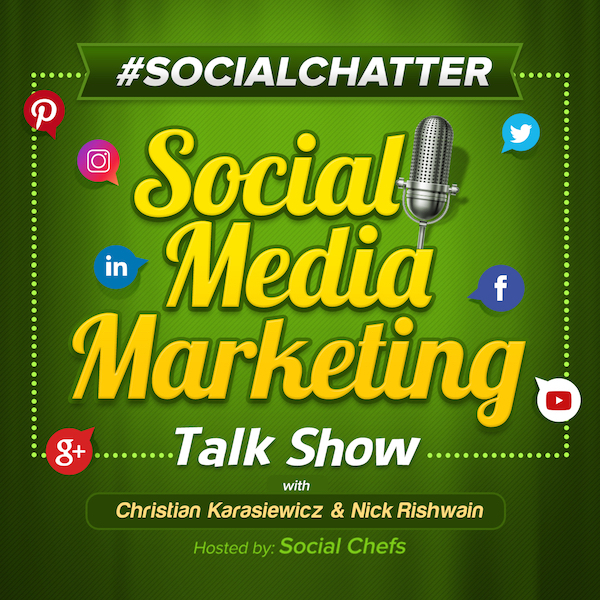 Let’s see what’s cooking in social media this week with your hosts, Christian Karasiewicz and Vincent Orleck! This week, Facebook added the ability for Facebook Pages to create Facebook Notes. If you have a Facebook Profile, you now get the new look from your profile. Here’s a video on how to use the new Facebook Notes for Facebook Pages. For a complete rundown, be sure to read the ultimate guide to Facebook Notes. This week, Twitter announced Twitter conversational ads. The purpose of this feature, which is exclusive to Twitter, is to “make it even easier for consumers to engage with and then spread a brand’s campaign message." Re/Code reported that Twitter was testing increasing the length of a tweet. Instead of 140 characters, they’re considering increasing that to 10,000. Wondering how long 10,000 characters is? You can view an example here. In other news, Oracle purchased AddThis. Quuu is a content suggestion tool for your social media channels. Select the categories that interest you. They will send hand curated content over to Buffer. Within your Buffer queue, you can then curate posts within your Buffer account. Buffer released a Google Chrome extension for their popular image creation tool, Pablo. With their browser extension, you can click on the Pablo button on an image. This will add them image to Pablo for you to work with. Do you find it difficult to concentrate when reading? This mobile app let’s you read books on your mobile device with the added benefit of adding a soundtrack while you’re reading. The faster you read, the faster the music goes. That’s it for this week’s episode of Social Chatter. Be sure to tune-in to our next episode on Blab to find out what’s cooking in social media! If you have any questions about anything mentioned this week, share them with us on Facebook, Twitter, LinkedIn or in the comments below. @Ileane hey hey hey girl????????? @socialchefs Who will ever read that on Twitter? Twitter is a newsfeed. Not a content feed. @Nathalief great! Let me know if you run into any issues signing up. Ok great advice! Thanks! You guys are great. I will do! It’s a goal setting session! Can I call in to say hi to you now to see what it is like? @RobynsWorld Thanks my dear. I will! Welcome @Jen_J_Ramsey! What will you be Blabbing about? Thanks for joining @jtcormick ! Hi I just came back I won’t bother you by trying to call in. I’ll be improving my internet someway before I start next week. I’m running a 7 day goal setting challenge next week for free. Thank you 🙂 Great to be here. I don’t want to interrupt your flow guys! Hi I will thanks – you are very kind! Thanks for joining @Hopeisaduty !